I have a BlackBerry Bold 9650 running a leaked version of OS6. I have resigned myself to the limitation of running a leaked OS. I was presented with a BlackBerry question I could not answer for another leaked OS user. 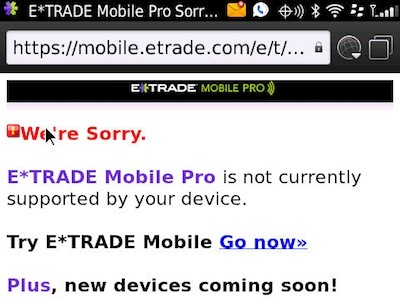 How can you download and install ETrade Mobile Pro on a BlackBerry running OS 6? The challenge is when you navigate to the ETrade site you get blocked from installing. I suspect the block is related to the detected OS version. I almost suggested downgrading, but figured there may be and easier way. Or is the the cost of running a leaked OS/latest OS? Use BBSAK to dump the .cod files from a device in which it does install on fine. Then, push those .cods to your device manually also using BBSAK thus, avoiding the need to even download direct from the site. What is BBSAK? I have a torch and can not get mobile pro to download either. You can try http://stormota.com/448. I just uploaded a JAD that should download properly on a 9650 running OS6. All it does is installs the same version that 9700/OS5 users will get, but I don’t see why it shouldn’t work for you.